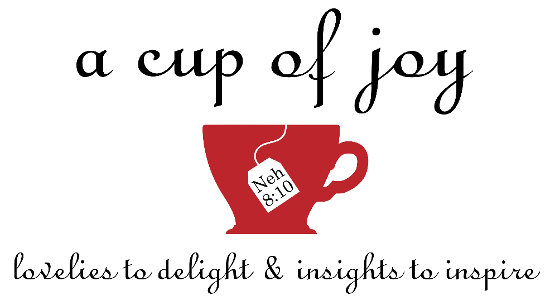 The mission of a cup of joy is to provide Christian inspirational products that encourage and bring joy to believers. When we face trials of various kinds, it can be difficult to "consider it joy" (James 1:2). But, we can ask the Holy Spirit to be as a tea pot in filling the tea cups of our hearts to overflowing (John 15:11; Psalm 23:5) with the joy of the Lord, which is our strength (Nehemiah 8:10). My prayer is that God will use this website and these products to glorify Him, to encourage you, and to fill your heart and life with His limitless joy.